Three distinct forms of Burkitt's lymphoma have been described. The endemic type occurs more often in children and exhibits increased head and neck involvement. The sporadic type mainly exhibits gastrointestinal involvement and is found more often in older children. The third subtype is associated with immunodeficiency and is most often found in adults. Sporadic Burkitt's lymphoma is relatively rare in the head and neck region, accounting for about 25% of all cases. Reported sites of sporadic Burkitt's lymphoma of the head and neck include the base of the tongue, tonsils, maxilla and mandible. The jaw is involved in about 7% of cases. In contrast, in the endemic variant, the jaw is involved in 65.9% of cases and the paranasal sinuses in 12.2%. 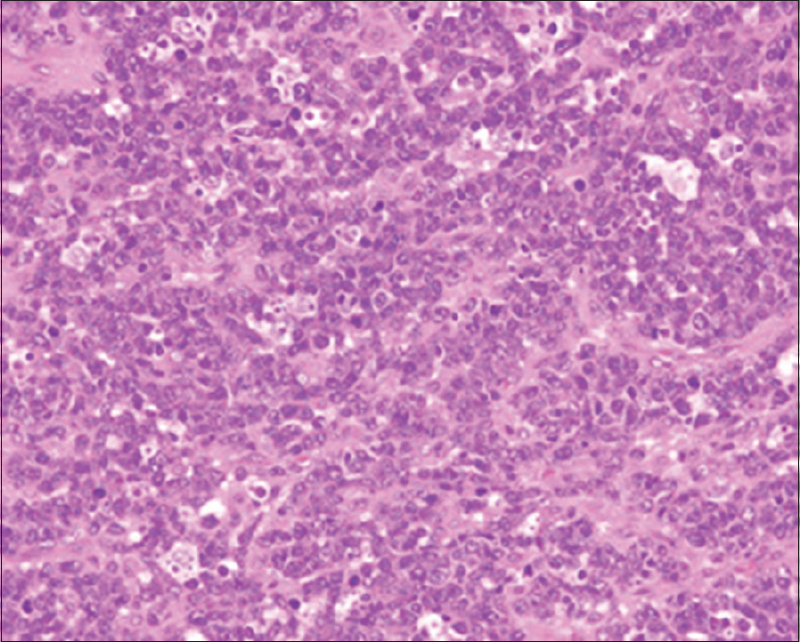 Diagnosis of this tumor can be achieved through biopsy; pathognomonic histopathological and immunohistochemical features include a “starry-sky” appearance and a high proliferation index. Multiagent chemotherapy is the mainstay of Burkitt's lymphoma treatment, and currently, high-intensity regimens over a short duration are used. Common regimens include cyclophosphamide, vincristine, prednisone and doxorubicin or cyclophosphamide, vincristine, methotrexate, 6-mercaptopurine and prednisone. Surgical options are limited, including debulking or obtaining biopsy. 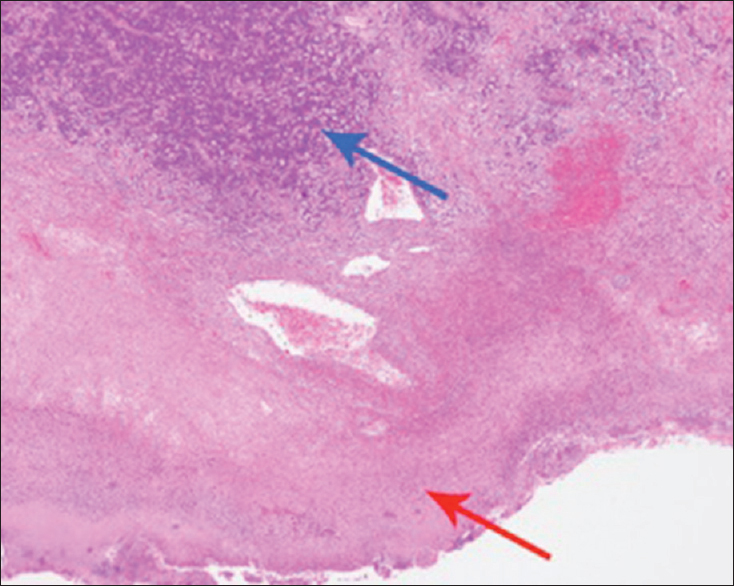 This case report describes a 28-year-old male patient who initially presented with voice change that was subsequently diagnosed as sporadic Burkitt's lymphoma. The aim of this article is to report sporadic Burkitt's lymphoma in an adult male manifesting with uncommon clinical and anatomical presentation in the hypopharyngeal area. A 28-year-old male patient presented to the Otolaryngology Clinic with complaint of voice change for 45 days; the patient had no notable previous medical history. The symptom was preceded by an upper respiratory tract infection, which resolved, but the voice change persisted. He had no history of dysphagia, odynophagia and difficulty in breathing. However, the patient had later developed cough with blood-tinged sputum. On physical examination, flexible nasal endoscopy revealed a mass (3 cm × 3 cm diameter) at the base of the tongue with smooth mucosa. 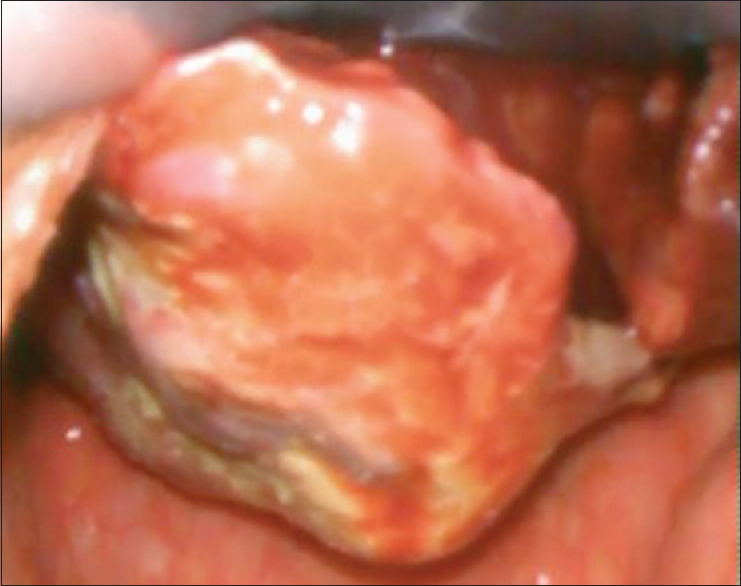 Using a 70° scope, a round mass originating from the left wall of the hypopharynx was found to partially obscure the laryngeal inlet, but the mobility of both vocal cords was intact. The remaining findings of the otolaryngology examination were unremarkable. Contrast computed tomography was performed, which showed an ovoid swelling measuring 3.97 cm × 3.2 cm, with mild diffuse enhancement. The mass involved the left side of the pharynx and hypopharynx with encroachment into the midline and obliteration of the left vallecula [Figure 1]a, [Figure 1]b, [Figure 1]c. The patient was then admitted for elective examination under general anesthesia, and a biopsy of the lesion was performed. The preoperative complete blood count was unremarkable. Serology testing was positive for anti-Epstein–Barr virus IgG. Histopathological examination revealed diffuse infiltration of metaplastic lymphoid cells in the subepithelium interspersed with macrophage bodies, resulting in a “starry-sky” appearance. Mitotic figures were abundant, and the covering epithelium was ulcerated with bacterial colonization [Figure 2] and [Figure 3]. 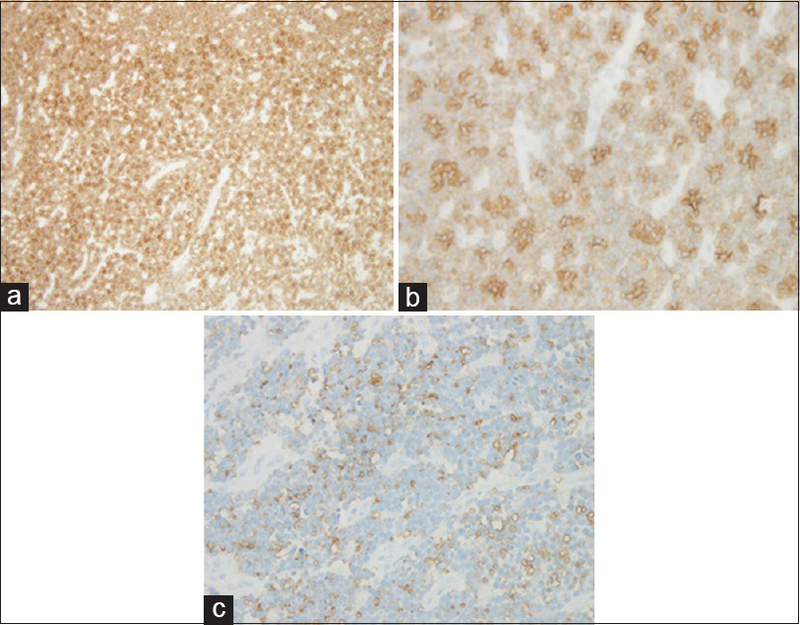 An immunohistochemical panel was performed: the tumor cells were reactive for CD10, CD79a and CD20 [Figure 4]a, [Figure 4]b, [Figure 4]c. A 100% proliferation index was found using Ki-67. Based on these results, a diagnosis of sporadic Burkitt's lymphoma was established. The patient then underwent elective surgical tracheostomy and excision of the mass [Figure 5]. The postoperative period was uneventful. The tracheostomy tube was downsized, and the patient was able to maintain oxygen saturation on room air. The patient was then transferred to another hospital to receive systemic chemotherapy. At the time of reporting this study, there had been no evidence of recurrence in the 2 years since the primary treatment. Sporadic Burkitt's lymphoma is a relatively uncommon disease that occurs in 2–3 cases per million and most commonly affects the abdomen (56% of the cases)., In the head and neck, the most frequently affected sites are the nasopharynx and tonsils, and the usual presentation is cervical lymphadenopathy.,, Sporadic Burkitt's lymphoma is found in older children, with an average age of 12.2 years. In adults, it usually occurs before the age of 35 years, with a mean age of 30 years. In addition, there is a male preponderance, with a male:female ratio of 3–4:1. In our case, the patient did not present with any of the common presentations of sporadic Burkitt's lymphoma of the head and neck such as cervical lymphadenopathy, jaw and facial swelling, neck masses, nasal blockage and difficulty in breathing.,,, In a similar case involving a geriatric patient, sporadic Burkitt's lymphoma was found in the right side of the tongue's base, crossing the midline and extending into the vallecula. The patient had presented with complaints that were similar to that of our patient (i.e., dysphonia and cough); however, that patient also had additional associated symptoms such as odynophagia. In another case of sporadic Burkitt's lymphoma of the larynx in a geriatric patient, the presenting symptoms were dysphonia, neck swelling and stridor; the patient died due to airway obstruction. This was likely because sporadic Burkitt's lymphoma has a rapid growth pattern, and thus can compress and/or obstruct vital structures. Different modalities have been used to treat Burkitt's lymphoma, but systemic chemotherapy is considered the standard treatment owing to the tumor's sensitivity to cytotoxic agents. In addition, the disease-free survival rate after treatment with chemotherapy is 90% in pediatric patients and 50%–60% in adults. Surgical options may be considered for debulking, to obtain biopsy or, as in our case, to excise the tumor. Depending on the anatomical site of the tumor, surgical intervention has some advantages such as eliminating the risk of airway compromise, which was the rationale for choosing surgical intervention in our case. On the other hand, radiotherapy has a more limited role. It can be used in cases of central nervous system involvement or in palliative treatment., Poor prognostic factors of Burkitt's lymphoma are old age, African American race and advanced stage of the tumor. Although rare, sporadic Burkitt's lymphoma should be considered in cases with hypopharyngeal masses. As it is a fast-growing tumor, prompt diagnosis and urgent treatment are essential for adequate response to treatment and higher survival rates. 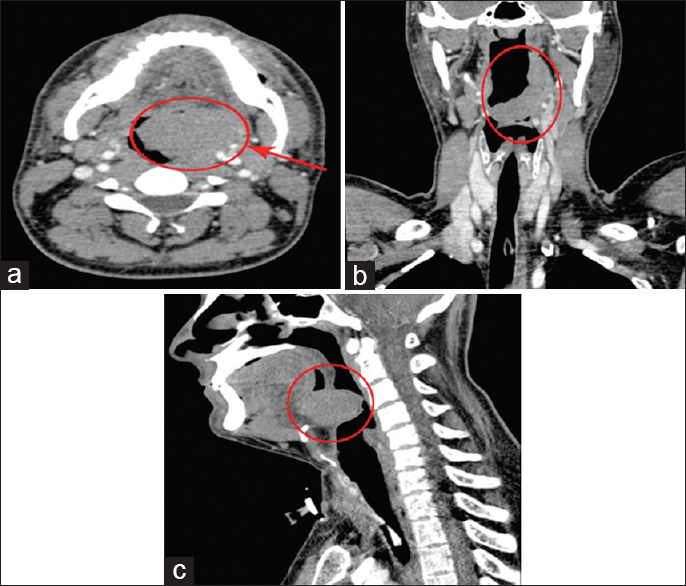 Sporadic Burkitt's lymphoma may occasionally present extranodally in the head and neck, and this case report describes one of its unusual sites of occurrence. It should be noted that typical symptoms might not always present, as was with our case, where the patient did not have any of the most common presenting complaints. Nagy G, Chira R, Crisan D, Munteanu M, Mircea PA. Unusual multiple metastatic localisations in adult Burkitt's lymphoma. A case report. Med Ultrason 2016;18:518-20. Verma S. Burkitt's lymphoma: Thorax to pelvis. Indian J Chest Dis Allied Sci 2016;58:49-51. Bouali S, Said IB, Yedeas MD, Abderrahmen K, Maatar N, Boubaker A, et al. Primary sporadic Burkitt lymphoma of the orbit, clinical characteristics, management, and outcomes: A case study. Childs Nerv Syst 2016;32:437-40. Banthia V, Jen A, Kacker A. Sporadic Burkitt's lymphoma of the head and neck in the pediatric population. Int J Pediatr Otorhinolaryngol 2003;67:59-65. Feinberg SM, Ou SH, Gu M, Shibuya TY. Burkitt's lymphoma of the base of the tongue: A case report and review of the literature. Ear Nose Throat J 2007;86:356-60. Amusa YB, Adediran IA, Akinpelu VO, Famurewa OC, Olateju SO, Adegbehingbe BO, et al. Burkitt's lymphoma of the head and neck region in a Nigerian tertiary hospital. West Afr J Med 2005;24:139-42. Quimby AE, Caulley L, Rodin D, Purgina B, Eapen L, Shier L, et al. Primary Burkitt lymphoma of the supraglottic larynx: A case report and review of the literature. J Med Case Rep 2017;11:65. Levine PH, Kamaraju LS, Connelly RR, Berard CW, Dorfman RF, Magrath I, et al. The American Burkitt's lymphoma registry: Eight years' experience. Cancer 1982;49:1016-22. Pannone G, Zamparese R, Pace M, Pedicillo MC, Cagiano S, Somma P, et al. The role of EBV in the pathogenesis of Burkitt's lymphoma: An Italian hospital based survey. Infect Agent Cancer 2014;9:34. Costa LJ, Xavier AC, Wahlquist AE, Hill EG. Trends in survival of patients with Burkitt lymphoma/leukemia in the USA: An analysis of 3691 cases. Blood 2013;121:4861-6.